The Porter Cable miter saw stand is an essential piece of equipment you will have for your work area. With this stand, you are going to be able to cut your wood in a more accurate manner and it will help to ensure that pieces of wood can easily be combined at the same time. For the woodworking professional, this is going to prove to be an essential tool. One of the things you are going to notice with the Porter Cable miter saw stand is that you also have an increased level of safety when you use it. That is because it can handle the overall weight that is associated with the project that you are doing and the fact that you can safely place your tools on it, while protecting your hands and person. Keep in mind that this tool is an actually accessory to the miter saw that you purchase. What you are going to note is that each stand you look at will be able to handle a variety of miter saws that can be associated with it. 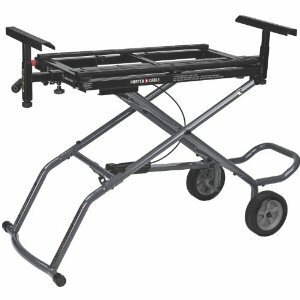 Along with that you are going to find that this portable miter saw stand is going to be a great choice for those who are on the go and often have to handle several different jobsites at the same time. More importantly, you are going to find that the Porter Cable miter saw stand is adjustable in height as well. This is important since no two people are the same height and there are times when you need to be able to tackle a project in a different manner. That means this fully versatile unit will provide you with the tools to make it happen. The construction of this unit is remarkable as well. The saw stand has the ability to withstand up to 300 pounds and it uses a durable tubular steel frame to help ensure that the construction remains strong and intact. This makes it one of the best choices you are going to have when you are looking for a miter saw stand. When you combine this with the 7 feet of workspace that you can use for this product, you can quickly see how it can be considered one of the top choices for anyone who is looking for a miter saw stand that they can trust. Just like any item out there, there are some aspects that might be a little less than desirable for some people. For instance, this unit can be bulky and heavy to drag around, so you will want to keep that in mind. When you are considering your options for a new Porter Cable miter saw, be sure that you take the time to explore all the different options that you have. That way, you can pay close attention to the features that are available and you are able to ensure that you only end up with the best options around. Since this is a cost effective solution, there is no doubt that you can potentially fit one of these miters saws into your actual budget. Return From Porter Cable Miter Saw Stands Page to Home - Finishcarpentryhelp.com.